Before proceeding further with this tutorial, you need to create a new application and a RadComboBox declaration in your XAML. The ComboBox control will be populated with all Products from the Northwind database. 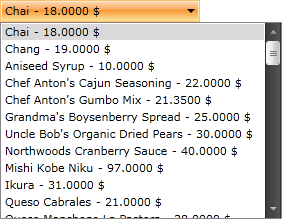 In the drop-down list the ProductName and the UnitPrice properties will be displayed. Add the following code which will make the initial load of the objects. You need to declare a custom DataTemplate to determine how the items in the drop-down will look like. Add the following DataTemplate declaration in your XAML resources. Find your RadComboBox declaration and set the declared DataTemplate to its ItemTemplate property. This section will show you how to populate your RadComboBox control in a MVVM manner. The RadComboBox will be bound to a data source object, that has a property Products. When the control is loaded, all products from the Products table in the Northwind database are loaded asynchronously. In the NorthwindDataSource class add a reference to an ObservableCollection of Products. Declare a custom DataTemplate to determine how the items in the drop-down will look like. Add the following DataTemplate declaration in your XAML resources. Update your RadComboBox declaration - set the ItemsSource and ItemTemplate properties.